Cutaneous melanoma accounts for the majority (~75%) of skin cancer deaths. Despite the recent improvements in prevention and early detection, approximately 20% of patients with melanoma still die from the diseases. Patients with metastases have a poor prognosis and a very short life expectancy. About 50% of human melanoma harbor BRafV600 mutations. Vemurafenib (Vem), a specific inhibitor of the mutated BRaf, is very effective for treating metastatic melanoma. Unfortunately, drug resistance emerges 3-18 months post treatment due to alternative mechanisms that reactivate the MEK/ERK pathway. Vem resistant melanoma, however, exhibits elevated expression of melanoma associated antigens, gp100, MART-1 and Tyrosinase. Thus, the drug resistant disease provides opportunity for two independent, yet complementary, therapeutic approaches, i.e. synthetic lethality and cancer vaccine. To block the alternative Raf kinase, we have discovered that the suppressor gene Sprouty4, when delivered by LPH (lipid-polycation-hyaluronic acid) nanoparticles (NPs) developed in this group, could effectively down-regulate MEK/ERK pathway, leading to reduced growth rate in Vem resistant melanoma. We will follow up this novel gene therapy strategy by using a newly discovered lipopolyplex containing polymetformin (aim 1) to demonstrate the mechanism of the synthetic lethality (aim 2). Polymetformin is much less toxic than the equivalent polyethyleneimine and inhibits mTOR to further suppress the survival mechanism of the tumor cells. Since our Vem resistant tumor is also PTEN deficient, we will also develop a siRNA therapy to silence Akt. At the same time, we will use a BRaf mutant melanoma in a syngeneic mouse model to study tumor growth inhibition using a new mRNA vaccine formulation (aim 3). mRNAs of several melanoma associated antigens, including those up-regulated in Vem resistant tumor, will be formulated in LCP (lipid-calcium-phosphate) NPs and delivered to the dendritic cells in the lymph nodes. Preliminary data indicate that this approach was very effective in inducing an antigen-specific CTL response in the host and significantly inhibited the growth of the primary as well as the metastatic melanoma in the lymph nodes. 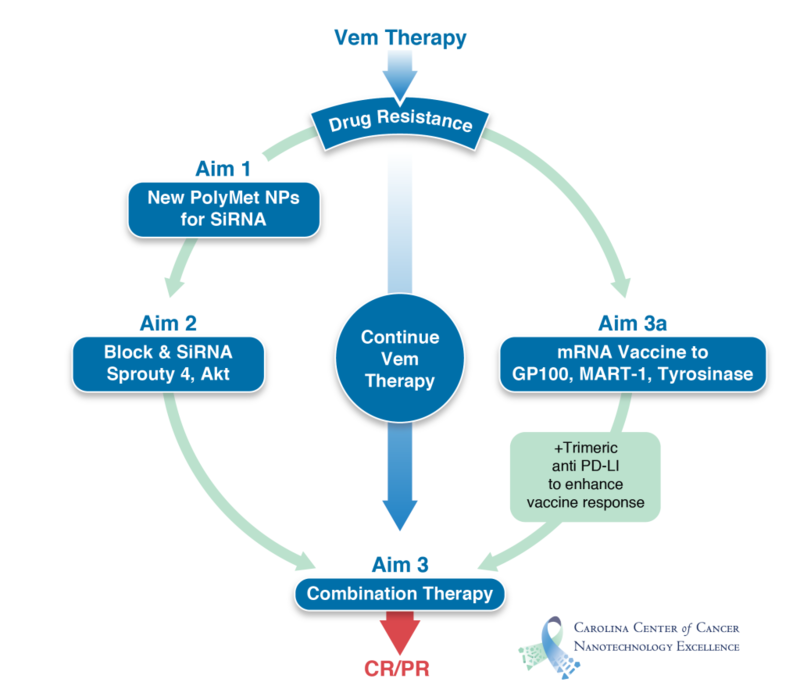 We will finally combine the gene/drug therapy with the vaccine therapy to overcome Vem resistance in melanoma.